Physical Phonics for Reading and Spelling Success! There are so many ways to make phonics fun and interactive. 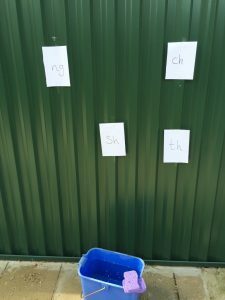 If you can get children outside and moving, you get phonics practise plus: fresh air, active kids and it’s a hit with the boys – win, win, win! Laminate letters and stick them around the playground. You say a sound and children use a water gun to shoot the letter! Turn it into a spelling game by saying a word and soaking the letters in order. If you don’t have a water gun use a bucket of water and sponges. Take chalk outside and rather than a mini-whiteboard children chalk their words! In the warmer weather, take a pot of water and a paintbrush and write the words on the hot pavement. Write target words on each balloon. Children must accurately decode and blend the sounds together to read the word. If children read three words (differentiate depending on ability) they get to pop a balloon! Every school has a set of these lurking around. Use them for phoneme/sound segmentation. For example, sound out the word ‘shop’ and children jump into a hoop for each sound: sh – jump, o – jump and p – jump! A classic game from every teacher’s childhood. Insert sight words or decodable words into each square. Children throw a pebble and hop to the word, reading each word as they move up the hopscotch. Write target words on A5 size papers. Fold them up and hide them around the playground. In pairs, children hunt for the words. 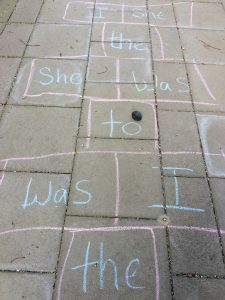 When they find a word one child reads the word and the other spells it (get children to ‘chalk it’ on the ground). How many words can children find, read and spell in 15 minutes? This is one we have blogged about before. Turn a Phonics Hero game into the ‘real life’ version! 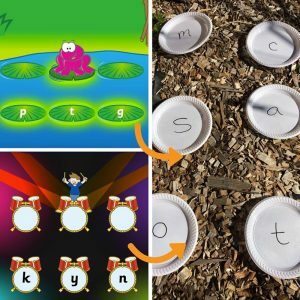 Take plastic plates (so you can reuse for different words), you say a sound and children hop to the correct leaf…all the way across the pond! For more inspiration have a search on Pinterest – there are heaps of physical ideas! Elaine is a primary school teacher who has taught in Ireland and Australia for the past 13 years, in both mainstream classes and learning support. 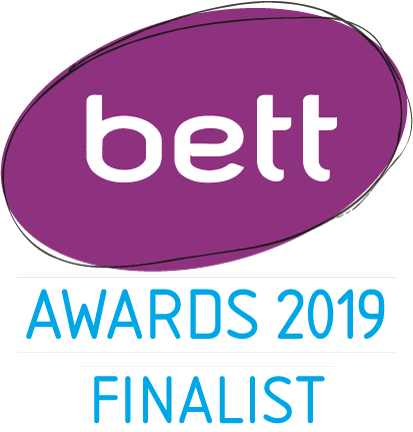 She passionately believes in the importance of phonics being taught explicitly in order to provide a solid foundation for reading and spelling.